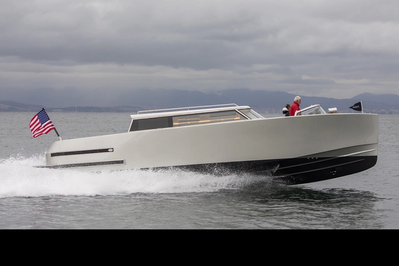 The X40T Limousine Tender, a unique custom 40-footer envisioned as a modern Venetian water taxi by Reliant Yachts partners Dave MacFarlane and Jim Ewing. 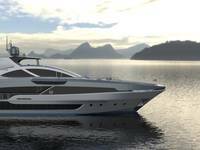 The X40T is one of a trio of tenders for a new superyacht, and the Tender has the same clean lines and powerful hull shape as its sistership, the X40 Express. 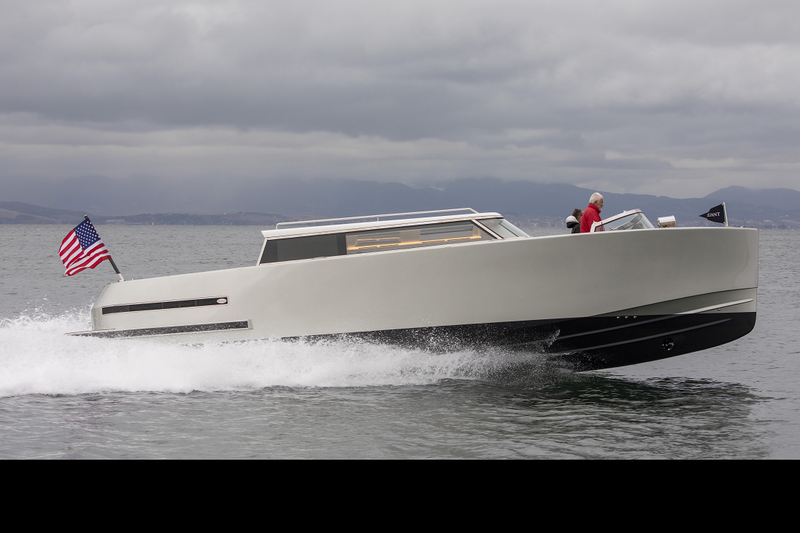 All three boats, including the surprisingly versatile X40L Lander, share a 40-foot overall length, an expanse of teak (or Flexiteek) deck, and metallic silver paint jobs accented in black. The X40T cuts a profile much like the Express with a nearly plumb bow and subtly reversed transom over complementary stern platform. In the “cab” or main saloon, there is full standing headroom with excellent views all around, whether standing and sitting. The spacious saloon and aft cockpit is for passengers, and a forward drivers cockpit accommodates two crew, protected by a wrap-around windscreen. Passengers board the vessel immediately aft of the forward cockpit, aided by pair of removable stanchions as they step across the deck, down a couple steps, and turn aft into the main saloon, which easily seats eight in leather-upholstered, commuter-style luxury. Passengers can access convenient wifi routers and use Apple Airplay to engage a powerful stereo system from their smartphones. Passenger seating in the saloon has high backs and bolsters for comfort and security, with excellent 270-degree views of the surrounding scenery. When standing, passengers take a step down to the sole providing them both with headroom and equivalent visibility when moving fore and aft. Overhead, a large, clear section of the roof retracts when the weather is fair. For privacy, leather window blinds can be deployed at the press of a button. The aft end of the saloon features a full head compartment to port and a galley and bar to starboard, plus a door to the open-air aft cockpit. Above, the cockpit can be covered by a powered awning for sun protection. Entry and exit from this cockpit is also an option. A section of the deck is removable at the stern, and removable stanchions can be place here on the side decks, as well. The hull is built using a time-tested epoxy, cold-molded wood laminate and a super-light carbon fiber deck with a classic teak surface. 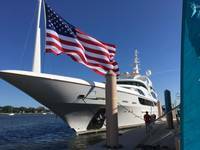 The roof of the saloon is also built of carbon fiber, as are the boat’s radar mast and ensign flagstaff. Even the tissue boxes in the saloon are made of carbon. All contribute to keeping the boat as light as possible while delivering both luxury detailing and powerful systems, such as a Seakeeper3 to provide excellent stability, Side Power bow-thrusters, and an Onan generator to drive two powerful Webasto air-conditioning units for the main saloon. Success was proven in early sea trials near Istanbul in 10-knot winds and 1- to 2-foot seas. The X40T design brief was to create a 40-foot limo that ran up to 30 knots, yet wide open in early sea trials, the twin Cummins QSB 6.7 425HOI diesels and Konrad 660b Stern Drives took the boat up to 38 knots. Cruising speed was 26.2 knots at 2400 RPM. The stern drives were selected because they lift up under the stern platform, reducing draft for easier storage in the mothership’s transom garage. 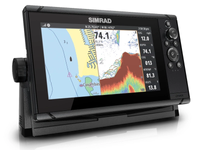 At the helm, a pair of bright Raymarine Glass Bridge monitors (15.4 inches each) and other Raymarine electronic displays sit on a flat-black, carbon-fiber dashboard with a Yacht Controller joystick and the Seakeeper controls close by. The modern carbon look extends 270 degrees around the cockpit, against which the chrome throttles, cup holders and windshield trim sparkle while the wood-trimmed steering wheel, and teak deck outboard and on the cockpit sole speak to a timeless sensibility. As on the other tenders, the deck has several unobtrusive Sea Smart fittings including flush deck fills, retracting deck cleats, and receptacles for stanchions, port and starboard, fore and aft, to aid passengers when boarding. On deck and below, Reliant’s clean, almost spare aesthetic is extraordinarily consistent. The X40T Limousine Tender delivers speed and luxury far surpassing your average Venetian water taxi and is both uniquely suited to her task and closely related to her sisterships to meet a superyacht owner’s demanding requirements.